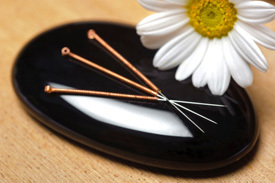 Experience the healing power of acupuncture at Chiropractic Wellness Center. We use acupuncture at Chiropractic Wellness Center to complement the healing power of chiropractic care. By combining chiropractic care and acupuncture, our patients often feel better, heal faster and stay well longer. Acupuncture is very helpful for musculoskeletal issues such as neck pain, back pain, headaches and any joint problems in the ankles, knees, elbows and shoulders. Many patients find that acupuncture also helps with stress relief and other unusual conditions such as rashes, vertigo or radiating pain (like sciatica, neuropathy and neuralgia). When you arrive, we’ll sit down for a consultation to discuss what is bothering you and find out more about your condition. Then, we’ll perform a thorough examination of the area(s) of your concern. If you’re new to acupuncture or have questions about the process, just ask us about it. We’ll make sure you’re comfortable before we begin, even demonstrating on ourselves to show you how simple and pain free the treatment can be. Because of the fineness of the needles (they’re about as thick as a strand of hair), many patients don’t even realize the session has begun! Contact us today and let’s set up a time for you to experience acupuncture for yourself!